While setting up the new Broadway production Gettin’ the Band Back Together, I needed to find a solution for an accurate Leslie emulator. Even though having an actual Leslie cabinet would be wonderful, it’s not always ideal for a Broadway show given the considerations for space, noise leakage, and practicality. It’s not always easy to find a good location in a Broadway theatre to place a Leslie cabinet, often the loud volume of the cabinet can be distracting for other departments which need to work in close proximity, microphones can easily get bumped accidentally (interfering with the mix), and there can be reliability issues. 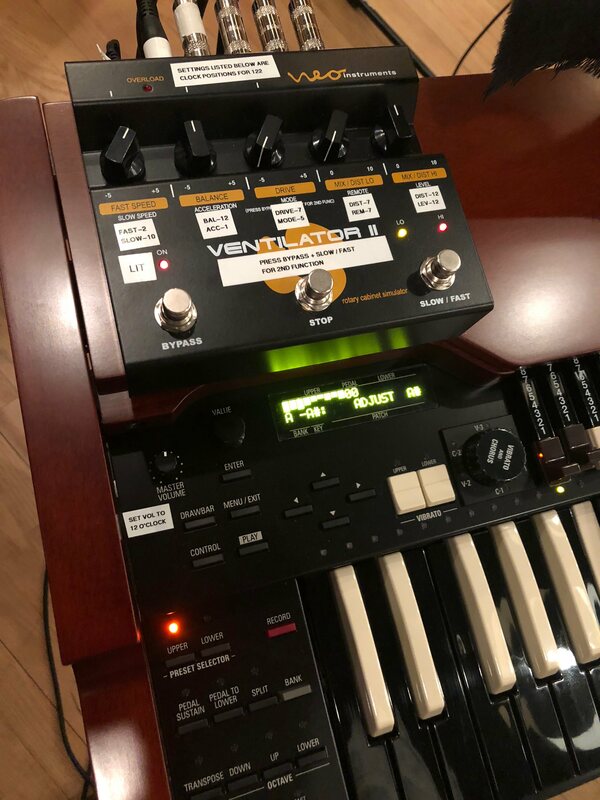 After much research, we found a great solution in the combination of the Hammond XK5 single manual organ and the NEO Ventilator 2 Leslie emulator. While the Hammond XK5 has a fantastic sound, action that feels like a real B3, and great drawbar response, its Leslie emulation leaves much to be desired. As soon as I heard it played through the NEO Ventilator 2 I was hooked. The Hammond XK5 sounds a bit warmer through the Ventilator and the Leslie effect sounds significantly more accurate. The most tricky part of using the Ventilator is learning how to program it. Certain functions can only be accessed via pressing certain buttons in specific combinations. Once I figured this out, I realized that the manual is quite thorough. That said, the information in the manual could be spelled out a bit more clearly. We selected the Ventilator settings that correspond to a Leslie 122 cabinet, though there are instructions for how to emulate various other models of Leslie cabinet. The only thing that needed adjustment was the speed of the Leslie acceleration and deceleration along with tweaking the EQ on the Hammond XK5 itself. Once this was adjusted, the unit sounded beautiful both in headphones and in the overall mix in the house. 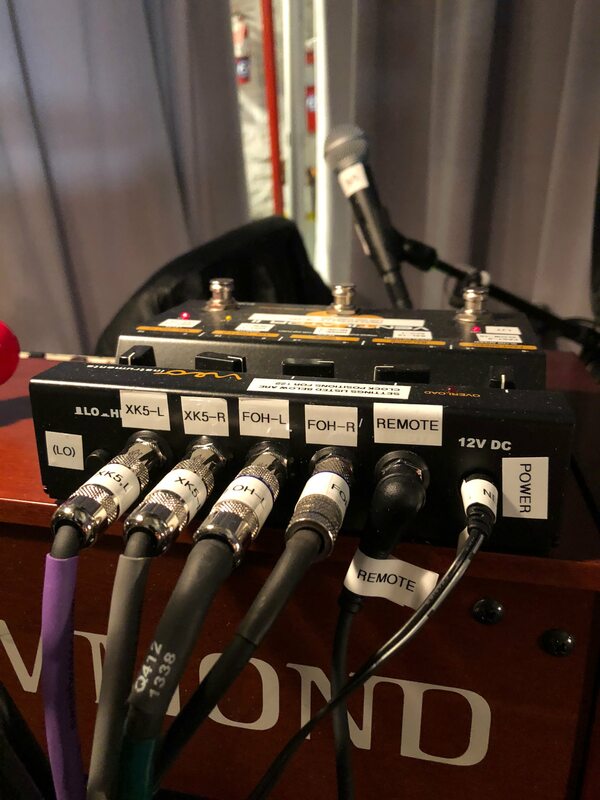 Although there is a custom remote switch that’s made specifically for the Ventilator, we decided to use a Hammond CU-1 half-moon switch to control the Leslie effect. This connects directly to the Hammond XK5. When using this switch it’s necessary to select the correct remote mode on the Ventilator, which required a bit of digging around and experimentation as the manual was a bit unclear on this. Once I figured out the settings, it worked beautifully. Customer support from the manufacturer has been consistently responsive, friendly, and helpful. The unit feels solid and well built, and most importantly, it sounds amazing! 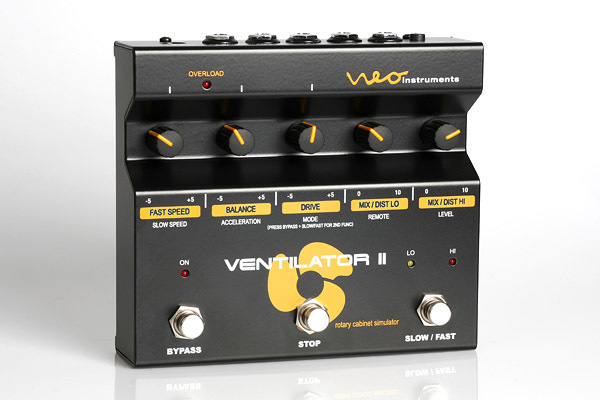 I highly recommend the NEO Ventilator 2 Leslie emulator. You can’t beat the price, size, and stellar performance.